Home|Uncategorized|Use Your Brain, Not Your Phone! Remember when you learned your first language? You probably don’t, because you were two and three years old, right? Do you remember studying your first language so you could speak to your parents? You didn’t. Nobody else did either. You didn’t run around with flash cards, and you didn’t study every night. Think about it: You learned thousands and thousands of words, and you never studied! And, you were only three years old! The human brain is really quite amazing. Now you’re older and you are learning a language different from the one that was so easy for you when you were a child. Yes, I know, things are different now. Well I have some advice for you that might help you learn English faster: Don’t translate everything! I know you think you are making your life easier by translating that word you don’t know. You find out what that word means in your first language, and you feel better, right? But did you really learn that word? Are you going to remember it tomorrow? I think you probably will not. Here’s a better idea for when you come to an English word you don’t know: guess what the word means. That’s what you did when you were three years old. You were good at it, and you can do it now too. You learned most words when you were three years old because you knew the context of that word and you made a good guess at what the word meant. So my suggestion to you is guess the word from the context. What do I mean by context? The context of a word is all the words around it. You don’t need to translate the word adapt. In this context, adapt means to change. The fish have had to change so they can live so deep in the ocean. 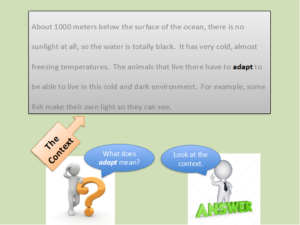 The context even gives you an example of fish adapting: they make their own light so they can see. When you guess what the word means from the context, you learn what the word means. So tomorrow, you’ll have a much better chance of remembering what that word means. 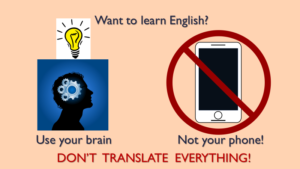 So if I say, if you want to really learn English, put away your phone and guess what it means from the context!